Download and install R and get the most useful package for machine learning in R.
Load a dataset and understand it’s structure using statistical summaries and data visualization. Create 5 machine learning models, pick the best and build confidence that the accuracy is reliable. If you are a machine learning beginner and looking to finally get started using R, this tutorial was designed for you. Photo by Henry Burrows, some rights reserved. How Do You Start Machine Learning in R? The best way to learn machine learning is by designing and completing small projects. R provides a scripting language with an odd syntax. There are also hundreds of packages and thousands of functions to choose from, providing multiple ways to do each task. It can feel overwhelming. The best way to get started using R for machine learning is to complete a project. It will force you to install and start R (at the very least). It will given you a bird’s eye view of how to step through a small project. It will give you confidence, maybe to go on to your own small projects. Books and courses are frustrating. They give you lots of recipes and snippets, but you never get to see how they all fit together. When you are applying machine learning to your own datasets, you are working on a project. For more information on the steps in a machine learning project see this checklist and more on the process. The best way to really come to terms with a new platform or tool is to work through a machine learning project end-to-end and cover the key steps. Namely, from loading data, summarizing your data, evaluating algorithms and making some predictions. If you can do that, you have a template that you can use on dataset after dataset. You can fill in the gaps such as further data preparation and improving result tasks later, once you have more confidence. The best small project to start with on a new tool is the classification of iris flowers (e.g. the iris dataset). This is a good project because it is so well understood. Attributes are numeric so you have to figure out how to load and handle data. It is a classification problem, allowing you to practice with perhaps an easier type of supervised learning algorithms. It is a mutli-class classification problem (multi-nominal) that may require some specialized handling. It only has 4 attribute and 150 rows, meaning it is small and easily fits into memory (and a screen or A4 page). All of the numeric attributes are in the same units and the same scale not requiring any special scaling or transforms to get started. Let’s get started with your hello world machine learning project in R.
In this section we are going to work through a small machine learning project end-to-end. Take your time. Work through each step. Try to type in the commands yourself or copy-and-paste the commands to speed things up. Any questions, please leave a comment at the bottom of the post. Get the R platform installed on your system if it is not already. UPDATE: This tutorial was written and tested with R version 3.2.3. It is recommend that you use this version of R or higher. I do not want to cover this in great detail, because others already have. This is already pretty straight forward, especially if you are a developer. If you do need help, ask a question in the comments. You can download R from The R Project webpage. When you click the download link, you will have to choose a mirror. You can then choose R for your operating system, such as Windows, OS X or Linux. R is is easy to install and I’m sure you can handle it. There are no special requirements. If you have questions or need help installing see R Installation and Administration. You can start R from whatever menu system you use on your operating system. For me, I prefer the command line. You should see something like the screenshot below either in a new window or in your terminal. Install the packages we are going to use today. Packages are third party add-ons or libraries that we can use in R.
Now, let’s load the package that we are going to use in this tutorial, the caret package. The caret package provides a consistent interface into hundreds of machine learning algorithms and provides useful convenience methods for data visualization, data resampling, model tuning and model comparison, among other features. It’s a must have tool for machine learning projects in R.
For more information about the caret R package see the caret package homepage. We are going to use the iris flowers dataset. This dataset is famous because it is used as the “hello world” dataset in machine learning and statistics by pretty much everyone. The dataset contains 150 observations of iris flowers. There are four columns of measurements of the flowers in centimeters. The fifth column is the species of the flower observed. All observed flowers belong to one of three species. You can learn more about this dataset on Wikipedia. Load the iris data the easy way. Load the iris data from CSV (optional, for purists). Separate the data into a training dataset and a validation dataset. Choose your preferred way to load data or try both methods. You now have the iris data loaded in R and accessible via the dataset variable. I like to name the loaded data “dataset”. This is helpful if you want to copy-paste code between projects and the dataset always has the same name. Maybe your a purist and you want to load the data just like you would on your own machine learning project, from a CSV file. Download the iris dataset from the UCI Machine Learning Repository (here is the direct link). Save the file as iris.csv your project directory. We need to know that the model we created is any good. Later, we will use statistical methods to estimate the accuracy of the models that we create on unseen data. We also want a more concrete estimate of the accuracy of the best model on unseen data by evaluating it on actual unseen data. That is, we are going to hold back some data that the algorithms will not get to see and we will use this data to get a second and independent idea of how accurate the best model might actually be. We will split the loaded dataset into two, 80% of which we will use to train our models and 20% that we will hold back as a validation dataset. You now have training data in the dataset variable and a validation set we will use later in the validation variable. Note that we replaced our dataset variable with the 80% sample of the dataset. This was an attempt to keep the rest of the code simpler and readable. Now it is time to take a look at the data. Peek at the data itself. Levels of the class attribute. Breakdown of the instances in each class. Statistical summary of all attributes. Don’t worry, each look at the data is one command. These are useful commands that you can use again and again on future projects. We can get a quick idea of how many instances (rows) and how many attributes (columns) the data contains with the dim function. It is a good idea to get an idea of the types of the attributes. They could be doubles, integers, strings, factors and other types. Knowing the types is important as it will give you an idea of how to better summarize the data you have and the types of transforms you might need to use to prepare the data before you model it. Sepal.Length Sepal.Width Petal.Length Petal.Width Species "numeric" "numeric" "numeric" "numeric" "factor"
"numeric" "numeric" "numeric" "numeric" "factor"
It is also always a good idea to actually eyeball your data. This is a multi-class or a multinomial classification problem. If there were two levels, it would be a binary classification problem. Let’s now take a look at the number of instances (rows) that belong to each class. We can view this as an absolute count and as a percentage. Now finally, we can take a look at a summary of each attribute. This includes the mean, the min and max values as well as some percentiles (25th, 50th or media and 75th e.g. values at this points if we ordered all the values for an attribute). We can see that all of the numerical values have the same scale (centimeters) and similar ranges [0,8] centimeters. We now have a basic idea about the data. We need to extend that with some visualizations. Univariate plots to better understand each attribute. Multivariate plots to better understand the relationships between attributes. We start with some univariate plots, that is, plots of each individual variable. It is helpful with visualization to have a way to refer to just the input attributes and just the output attributes. Let’s set that up and call the inputs attributes x and the output attribute (or class) y. Now we can look at the interactions between the variables. First let’s look at scatterplots of all pairs of attributes and color the points by class. In addition, because the scatterplots show that points for each class are generally separate, we can draw ellipses around them. This is useful to see that there are clearly different distributions of the attributes for each class value. Like he boxplots, we can see the difference in distribution of each attribute by class value. We can also see the Gaussian-like distribution (bell curve) of each attribute. Now it is time to create some models of the data and estimate their accuracy on unseen data. Set-up the test harness to use 10-fold cross validation. We will 10-fold crossvalidation to estimate accuracy. This will split our dataset into 10 parts, train in 9 and test on 1 and release for all combinations of train-test splits. We will also repeat the process 3 times for each algorithm with different splits of the data into 10 groups, in an effort to get a more accurate estimate. # Run algorithms using 10-fold cross validation control <- trainControl(method="cv", number=10) metric <- "Accuracy"
We are using the metric of “Accuracy” to evaluate models. This is a ratio of the number of correctly predicted instances in divided by the total number of instances in the dataset multiplied by 100 to give a percentage (e.g. 95% accurate). We will be using the metric variable when we run build and evaluate each model next. We don’t know which algorithms would be good on this problem or what configurations to use. We get an idea from the plots that some of the classes are partially linearly separable in some dimensions, so we are expecting generally good results. Classification and Regression Trees (CART). Support Vector Machines (SVM) with a linear kernel. This is a good mixture of simple linear (LDA), nonlinear (CART, kNN) and complex nonlinear methods (SVM, RF). We reset the random number seed before reach run to ensure that the evaluation of each algorithm is performed using exactly the same data splits. It ensures the results are directly comparable. Caret does support the configuration and tuning of the configuration of each model, but we are not going to cover that in this tutorial. We now have 5 models and accuracy estimations for each. We need to compare the models to each other and select the most accurate. We can report on the accuracy of each model by first creating a list of the created models and using the summary function. We can also create a plot of the model evaluation results and compare the spread and the mean accuracy of each model. There is a population of accuracy measures for each algorithm because each algorithm was evaluated 10 times (10 fold cross validation). The results for just the LDA model can be summarized. The LDA was the most accurate model. Now we want to get an idea of the accuracy of the model on our validation set. This will give us an independent final check on the accuracy of the best model. It is valuable to keep a validation set just in case you made a slip during such as overfitting to the training set or a data leak. Both will result in an overly optimistic result. We can run the LDA model directly on the validation set and summarize the results in a confusion matrix. We can see that the accuracy is 100%. It was a small validation dataset (20%), but this result is within our expected margin of 97% +/-4% suggesting we may have an accurate and a reliably accurate model. Work through the tutorial above. It will take you 5-to-10 minutes, max! You do not need to understand everything. (at least not right now) Your goal is to run through the tutorial end-to-end and get a result. You do not need to understand everything on the first pass. List down your questions as you go. Make heavy use of the ?FunctionName help syntax in R to learn about all of the functions that you’re using. You do not need to know how the algorithms work. It is important to know about the limitations and how to configure machine learning algorithms. But learning about algorithms can come later. You need to build up this algorithm knowledge slowly over a long period of time. Today, start off by getting comfortable with the platform. You do not need to be an R programmer. The syntax of the R language can be confusing. Just like other languages, focus on function calls (e.g. function()) and assignments (e.g. a <- “b”). This will get you most of the way. You are a developer, you know how to pick up the basics of a language real fast. Just get started and dive into the details later. You do not need to be a machine learning expert. You can learn about the benefits and limitations of various algorithms later, and there are plenty of posts that you can read later to brush up on the steps of a machine learning project and the importance of evaluating accuracy using cross validation. What about other steps in a machine learning project. We did not cover all of the steps in a machine learning project because this is your first project and we need to focus on the key steps. Namely, loading data, looking at the data, evaluating some algorithms and making some predictions. In later tutorials we can look at other data preparation and result improvement tasks. In this post you discovered step-by-step how to complete your first machine learning project in R.
You discovered that completing a small end-to-end project from loading the data to making predictions is the best way to get familiar with a new platform. Do you work through the tutorial? Work through the above tutorial. List any questions you have. Search or research the answers. Remember, you can use the ?FunctionName in R to get help on any function. Do you have a question? Post it in the comments below. Google Search provided no help. After getting featurePlot to work with all options other than “ellipse”, finally stumbled across the solution that you needed to have the “ellipse” package installed on your system. I’m guessing that you have that as a default library on your system, so you didn’t specify it was required to use that function. But how many people reading this post will be able to figure that out? Thanks for pointing that out Leszek. To be honest I’ve not heard of that package before. Perhaps it is installed automatically with the “caret” or “lattice” packages? Thanks for the post… worked after installed ellipse package. not installed with caret. Glad to hear it Rajendra. Thanks for the post. I tried Google first when I saw the error, interestingly the 5th search result is the link back to this post. 🙂 It works after installing ellipse package. Thanks Jason for this great learning tutorial! The result was that ALL the packages that were likely to be used by the “caret” package were also installed… including the “ellipse” package. You could have avoided your frustration by simply following the instructions in the tutorial. Wrong. I followed the instructions exactly as listed and it didn’t work for me either. When I explicitly installed the ellipse library it worked fine. Perfect remarks. Always follow the instructions of the tutorial. Great tutorial Jason, as usual of course. Thanks for highlighting the problem. True, it was hard to find a solution elsewhere on the Internet! Thanks! Your comment saved me! Recently I started with R. Great tutorials! I would like to ask you a question, hopefully you can point me in the right direction. Last year I bought software that develops trading systems for the stock market. The price history can be cut in three parts: in sample, out of sample and validation. For every trading system and every price part I have metrics like: net profit, drawdown, average trade result and so on. I would like to use the in sample and out of sample results (metrics) to try and predict the results (metrics) in the validation period.So I can determine what trading systems perform the best accoridng to the in sample and out of sample metrics and the algorithm. What algorithm can you advice me to use in this particular case? And, moving on, found that there were additional packages that needed to be installed and loaded, and then wound up with an Accuracy table that didn’t get the same results as you did, despite copying and pasting all the commands exactly as written. This doesn’t give me a lot of confidence about reproducibility in R.
It is true that strictly reproducible results can be difficult in R. I find you need to sprinkle a lot of set.seed(…) calls around the place, and even then it’s difficult. The reason why your accuracy table is not the same mainly comes from the fact that the “createDataPartition()” function chooses observations in the dataset randomly. This means that the training and validation datasets are essentially different for everybody. Consequently, the end results will be slightly different. createDataPartition(dataset2$Species, p=0.80, list=FALSE) is not working. I am getting the error message when i execute the above query. Let me know as what went wrong. I’ve added this command to the install packages section, just in case others find it useful. If the R version is 3.2.1 or below the caret package may turn incompatible. I faced similar issue. After uninstalling the old version I installed R 3.2.3 which fixed the error. Thanks Rajesh, I updated the post and added a note to use R 3.2.3 or higher. Thanks for sharing this. I had to grab another package (kernlab) to run the SVM fit, but everything rolled smoothly, otherwise. Great 15min introduction! Great to hear, thanks CW! That is a good question. It is a good idea to add a legend to your graphs. I did not add a legend in this case because we were not interested in which class was which only in the general separation of the classes. Type ?featurePlot to learn more about adding a legend. Thanks Jason. But more to the point .. where in the code do you assign the legend(or does the legend get picked up automatically ie which colour to which class. If it does so implicitly, how do I know what colour coresponds to what class? According to this (http://stats.stackexchange.com/questions/44343/in-caret-what-is-the-real-difference-between-cv-and-repeatedcv), the method parameter should have been “repeatedcv” and not just “cv”, and then the parameters repeats should have been 3. You can verify that the training takes longer and the confidence intervals of the plots are smaller, so I might be right. However, I am not absolutely sure if this is correct, because I don’t know how to visually check the folds. Also, I don’t know how to get each individual result of each cv and repetition from the fits, e.g. fit.lda. Thanks Jason for the great tutorial. I was able to reproduce the same results by following your instructions carefully. BTW, I reviewed some of the other posts above and most of the dependencies could have been resolved by loading the library(caret) at the beginning. I did encounter one issue prior to loading the library(caret) with the Error: could not find function “createDataPartition”. This error was resolved by loading the required library(caret). This loaded other required packages. If anyone wants more practice, I did my best to recall the code Chad Hines and I added to the tutorial so one can examine the mismatches for LDA on the training set. Thank you to Jason Brownlee for this tutorial and to Kevin Feasel and Jamie Dixon for coordinating the .NET Triangle “Introduction to R” dojo last week. Hi Jason, very thorough and great practice for a newbie like myself. I will definitely be referring back to this one often. I’m glad you found it useful Johnny. Thanks, Brownlee. I would like to know of selecting best model. Is it guaranteed that a model giving highest accuracy can give the result of highest accuracy for test data? In this example, you have selected lda as the best model comparing the accuracies of the used models. But it may not predict best during testing. So my question is: when should we select our model? After training models or testing models? We cannot be sure we have picked the best model. We must gather evidence to support a given decision. More testing with k-fold cross validation and hold-out validation datasets can increase our confidence. What can one do to get better at this? Any practice? Anything that builds on this? What happens when there is “noise” in the data, how do we clean it and apply it to ML properly? My advice is to practice on a suite of problems from the UCI ML Repo, then once you have confidence, start practicing on older Kaggle datasets. Nice one, thanks for sharing Jerry. which of the algorithms require e1071? I was able to run all but had to (or R did it itself) install packages rpart and kernlab. Is this a typo on this page? Yes, I intended to talk about the process of a machine learning project not being linear. I’ve fixed the typo, thnaks. Thanks for your feedback Rajendra. Thanks Jason, will take a look. I have just started learning R and trying to use this Tutorial to fit my Dataset into it, and had a few problems like missing packages, I did however notice that when you library(caret) it will say what is missing so it’s a simple case of install.packages(missing package displayed). “validation_index <- createDataPartition(dataset$Species, p=0.80, list=FALSE)"
My dataset is pretty large and I would like to split it into 3 or 4, like rather than an 80/20 split I would like a 50/25/25 or a 40/30/30. As I said I'm new to R so if my way of splitting it isn't the way it should be done just tell me :). I believe createDataPartition() is for creating train/test splits. You could use it to create one split, then re-split one of the halves if you like. Very Nice article. Thank you. It was a very good starter for me as a new R programmer. But one question I have is in section 6 (“Make Predictions”). I understand that we are predicting the accuracy of our model in that section. But can you please elaborate on how to make prediction for some new data set ? I am not clear in that prediction part. This is very helpful. Thanks. But I have a question. In a case where I have two datasets, will name them trainingdata.csv and testdata.csv, how do I load them to R but train my algorithm on training data and test it on the data set? Sorry, I don’t understand your question. Perhaps you can rephrase it? on the iris project, am getting an error for the function to partition data. See below commands. Check that you have the caret package installed. It sounds like your output variable is a real value (regression) and not a label (classification). You may want to convert your problem to classification or use regression algorithm and evaluation measure. Thanks for an excellent post Jason, great help! Thank you sir ! This is really the best tutorial . I learned a lot from it and i applied it to a different dataset . But how about comparing the models using ROC curve using the caret package ? I am using R x64 3.4.0. Sorry, I have not seen that error before. Perhaps post it as a question on stackoverflow? This was solved. Please check in discussion. 2) If you change plot=pairs, you can see output. If you want, ellipse, please install ellipse package. for print(fit.lda), I don’t see Accuracy SD or Kappa SD printed/displayed … any hints? Thanks. I think caret API has changed since I posted the example. You may, I have not done this myself in a long time. I do not recall the function name off-hand sorry. Hello Jason! Thanks for making this ML tutorial. I am having trouble in the model building part. I am getting error in “rpart”, “knn”. When I run the code for rpart, the error is “Something is wrong: all the accuracy metric values are missing:” “Error: Stopping” “In addition: There were 26 warnings (use warnings() to see them)” , however for “knn”, the last error line I am getting 50 warnings. I have a Version 1.0.136 of RStudio. Your help is much appreciated! I’m sorry to hear that. Ensure you have the latest version of R and the caret package installed. You may also want to install all recommended dependencies. Do you have such an R tutorial for regression problems too? This post is exactly what I was looking for. Very well put together and I’m excited about it. I will share it with some students over at UCSF. For those reading the comments, I typed everything in manually directly from Dr. Brownlee’s scripts. You learn more that way because you’re likely to make a mistake when typing at some point. Thanks Sunny, I’m glad you found it useful! It creates a composite plot of 4 boxplots side by side. Thank so much sir. This is very helpful. Sir, I have a question. When I run LDA, SVM, RF, CART model always shows that Loading required package: MASS for LDA and so on for all methods that you mention. Although I get the results without loading specific package for each methods,but is it any problem if load the specific package or not? And if I load the package for each methods then function will be change such as for random forest we need to call the model:- randomForest(…) with package “randomForest”. It is normal for caret to load the packages it needes to make predictions. I’m sorry, I have not seen this error. Perhaps check on stackoverflow if anyone has had this fault or consider posting the error there. Post some R&D was able to resolve it. Below are the actions i did. Nice work, glad to hear you figured it out. Need one help again. Thanks in advance. Since this is my first Data Science Project, so the question. What and how to interpret from the result of BoxPlot. It will be of help if you can kindly explain a bit of the outcome of the BoxPlot. The box plot shows the middle of the data. The box is the 25th to 75th percentile with a line showing the 50th percentile (median). It is a fast way to get an idea of the spread of the data. I am new to machine learning and attempting to go through your tutorial. The accuracy matrix for lad works however cart, knn, svn and rf do not work. Do you have any suggestions for how to fix this? I’m sorry to hear that. Confirm your packages are up to date. sir, how could i plot this confusionMatrix “confusionMatrix(predictions, validation$Species)”? Could anyone clarify this error ? Perhaps double check that you have all of the code from the post? So when we say lets predict something, what exactly we are predicting here ? In case of a machine (motor, pump etc) data(current, RPM, vibration) what is that can be predicted ? In this tutorial, given the measurements of iris flowers, we use a model to predict the species. The error i got, and also tried to install mass package but it not getting installed properly and showing the error again and again please help me sir. I’m sorry to hear that. Perhaps try installing the MASS package by itself in a new session? My question is regarding scaling. For some algorithms like adaboost/xgboost it is recommended to scale all the data. My question is how do I unscale the final predictions. I used the scale() function in R. The unscale() function expects the center(which could be mean/median) value of the predicted values. But my predicted values are already scaled. How can I unscale them to the appropriate predicted values. I am referring to prediction on unlabeled data set. I have searched for this in many websites but have not found any answer. Perhaps scale the data yourself, and use the coefficients min/max or mean/stdev to invert the scaling? You may have missed some code? Sorry, I am not familiar with that package or the error. Perhaps try posting on stackoverflow? It looks like you might need to install the “kernlab” package. e1071 error i have installed all packages….. When I created the updated ‘dataset’ in step 2.3 with the 120 observations, the dataset for some reason created 24 N/A values leaving only 96 actual observations. Copy and pasted the code from the post above. Any idea what caused or how to fix so that the ‘dataset’ is inclusive of all the training data observations? Doesn’t seem to be anything wrong with the IRIS dataset or either of the validation_index or validation datasets. Perhaps double check you have the most recent version of R? Update to OP, I reran the original commands from that section and was able to pull in all 120 observations for the training data. Not sure why it didn’t fetch all the data the first time but looks ok now. Just confirming, the above tutorial is a multiclass problem? Therefore, I should be able to apply the above methodology to a different k=3 problem. Is this correct? For my first Machine Learning Project, this was EXTREMELY helpful and I thank you for the tutorial. I had no problems going through the script and even applied to a dummy dataset and it worked great. So thank you. My question is more related to automation. Instead of manually assessing the accuracy of each model to determine which one to use for prediction, is there a way to automatically call the model with the highest accuracy in the “predictions <- predict([best model], validation)" script. Hope to hear from you soon. Perhaps try running the example multiple times? Sorry, I don’t have good advice on how to learn R, I focus on teaching how to learn machine learning for R.
For learning R I strongly recommend the Coursera.org “R Programming” certification course, When I took it it was free, now is paid, something around USD 50. Sorry, I don’t know about that dataset. successfully done, and got the result.Thanks for the great tutorial. But now i wonder, what to do further, how to use it in a generic manner for any dataset. How to use the created pred.model anywhere. Yes, you can use this process on other datasets. ohk, but to use any dataset we need to make the dataset similar to that of the iris dataset, like 4 numberic columns, and one class. Also, accuracy output is similar over the traning dataset , and the validation dataset, but how does that help me to predict now what type of flower would be next if i provide it the similar parameters. Now, for example i have to create a model which predicts the cpu utilization of the servers in my Vcenter or complete DC, how can i create a model which will take my continious dataset and predict that when the CPU utilization will go high and i can take proactive measures. Thanks for the clear and set by step instructions. But I just want to understand what I need to do after creating the model and calculating its accuracy ? Can you please explain to draw some conclusions/predictions on the iris data set we used ? You can finalize and start using it. I am not getting the same output as you got. Any suggestions on what I may be doing wrong. ?The code worked exactly till this command. Perhaps double check that you copied all of the code exactly? And that your Python environment and libraries are up to date? Thank you very much for the tutorial I have been very useful but I have a question, in the section of “print (fit.lda)” does not deploy “Accuracy SD Kappa SD”. What remains of the tutorial if you have given me exact, could you help me with this doubt ?. The API may have changed slightly since I wrote the post nearly 2 years ago. Great article for a beginner like me Jason! Appreciate your work in sharing your knowledge and educating. Is there a model fit for ‘multinomial logistic regression’ algorithm? There is, but I would not recommend it. Try LDA instead. Upon further reading of other articles written by you, I realize that I may not need to use ‘Regression’. My dataset has category variables as input and category attributes as output as well (having 7 levels). So, it is a classification problem and I’m assuming I can use one of the 5 models/fit you have given as examples here in this Iris project. Can you let me know if this is correct understanding? It works for me with the iris data. Thanks a lot Jason! But there are no “Accuracy SD Kappa SD ” from the output of the fit models. Should I change some settings to get them? I believe the API may have changed. I have a dataset with 36 predictors and one for classes (“1”, “2”, “3”) that I got it through clustering in the previous step. My question is: how can I reduce all my predictors into five variables representing specific dimensions in my study? Should I run PCA separately to produce a new dataset with 5 predictors and one for classes or is there any other ways? Yes, you would run dimensionality reduction first to create a new input dataset with the same number of rows. Perhaps caret is not installed or caret is not loaded? Maybe a very stupid question. But I read “Build 5 different models to predict species from flower measurements”. So now I am wondering what the predictions of the model tell me about this, how I can use it. For example I now go to the forest take some measurements, assume that the flower is one of those tested, and want to know which flower it is exactly. In a traditional regression formula it is straightforward as you can put in your measurements in the formula and the calculated estimates and get an outcome. But I don’t know how to use the outcomes in this case. You can then load the model feed in an input (e.g. a set of measures) and use it to make predictions for those measures. This tutorial really helpful. Thanks Jason. Hi Json how are ? Sorry, I don’t know about banking. Did you copy all of the code from the tutorial? Hi Jason, First of all great work. May God bless you for all your sincere efforts in sharing the knowledge. You are making a big difference to the lives of people. Thank you for that. I have a basic question. Now we have a best fit model – how to use it in day to day usage – is there a way I can measure the dimensions of a flower and “apply” them in some kind of equation which will give the predicted flower name? How to use the results? Kindly advise when you are free. Hi Jason – the post was good in telling what to do. However the how part is still missing. Hence still need help. Thank you. Where Xnew are new measurements of flowers. Thank you very much for your response. Yes – I was about to post that this link was indeed helpful in operationalizing the results. Thank you very much. Please keep up the great work. Thank you for sharing your methods and codes. It was very useful and easy to follow. Could you please share how to score a new dataset using one of the models? For example, in my training, random forest has the best accuracy. Now I want to apply that model on a new dataset that doesn’t have the outcome variables, and make prediction. Thanks Jason. I read through the link. I already finalized my model, now I need save the model and apply it for operational use. The dataset that I want to score doesn’t have the outcome variable. I am not sure which command I should use to make prediction after I have the final model. Can you suggest R codes to do so? You can use the predict() function to make a prediction with your finalized model. Hi Jason! Amazing post! I have the same doubt @TNguyen did. I Finalized the model and we know that LDA is the best model to apply in this case. How I predict the outcome variables (species) in a new dataframe without this variable? IN summary, how I deploy the model on a new dataset? Sorry, I´m new in this field and I´m learning new things all the time! 3.1 Dimensions. When I execute dim(datset) I get the answer NULL. Do you know why R Studio doesn’t show me the dimensions of the “dataset”? Perhaps confirm that you loaded the data? 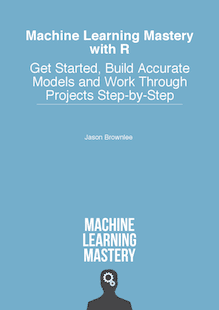 Very nice, Its given overall structure to write the ML in R.
Sorry, I don’t have examples of time series forecasting in R.
Please suggest me a path to become data scientist step by step, and how to become champion in R and python ?? Perhaps the API has changed. After that, i wrote every single line, and i really appreciate the big effoct you done to explain so clear!!! Do you know why R Studio doesn’t show me the Make predictions of the “dataset”? Perhaps try running the script from the command line? When I try to do the featurePlots I get NULL. I installed the ellipse package without error. I’m sorry to hear that. Perhaps there is another package that you must install? I was also getting same error. Great tutorial Jason! Inspired me to look up and a learn a bit more about LDA and KNN etc. which is a bonus! Great self-learning experience. I have experience with analytics but am a relative R newbie but I could understand and follow with some googling about the underlying methods and R functions.. so, thanks! One thing… the final results comparison in Section 5.3 are different in my case and are different each time I run through it. Reason is likely that in Step 2.3 there is no set.seed() prior. So, when you create the validation dataset which is internally a random sample in createDataPartition().. results are different in the end? Thanks. Yes, some minor differences should be expected. Jason Brownlee you the real MVP! hanks, I’m glad the tutorial helped. Each plot compares one variable to another. It can help you get an idea of any obvious relationships between variables. I have problem in this…. it can’t findout the objects….and function also..! what can i do? Jason, you’re indeed a MVP! Ran this in R 3.5. 1. install.packages(“caret”, dependencies = c(“Depends”, “Suggests”)) ran for almost an hour. May be connectivity to mirrors. First I’d like to say THANK YOU for making this available! It has given me the courage to pursue other ML endeavors. The only issue I have is that when summarizing the results of the LDA model using the print(fit.lda), my results do not show standard deviation. Do you know if this is due to a setting in R that needs to be changed? Yes, I believe the API changed since I wrote the tutorial. Really helped me overcome ML jitters. Very very grateful to you. But I really wanted to know the mathematical side of these algorithms, what do these do and how? Thanks for the feedback Shane. We focus on the applied side of ML here. For the math, I recommend an academic textbook. Very nice tutorial. The caret package is a great invent. where can I find a rapid theory of the methods to understand it better? Thanks for the suggestion. I generally don’t have material on unsupervised methods and I have not heard of an unsupervised random forest! I tried searching but could not find any instance of this error. If you have a problem with someone else’s code, perhaps talk to the about it? I just figured it out. The data was too sparse as I was including some unwanted columns in the dataset. Once removed, it worked fine. It was really amazing.. Please guide me to another projects for practice and to improve my skill set . You’re welcome, I’m happy that it helped! Working perfectly.Had to install many packages though.But all worked out well with some mouse clicks and with some Google. MY FIRST SUCCESSFUL MACHINE LEARNING TUTORIAL EVER!!!!! MANY THANKS JASON! !-Love and respects from India. Dear Brownlee , first of all thanks for this wonderful tutorial. I would like to learn that when we found the most accurate model , how can we ask to our model to test further samples , ie how can we run our test for one more sample data ? for example in your test lda was the most accurate, so if you want to ask your program to check for another data what is the code for it? Hey Jason, I have the same question as isa, and I’ve read your post on creating a final model. How does the idea of choosing a final model and giving it unseen data to analyze translate to R code? In the code above, for instance, lets say I wanted to give one row of iris flower qualities to fit.lda and have it guess what species it was. How would I do that? Thanks for the help. Thanks for the tutorial! I copy the code and it works fin till Predictions part. I get an error: Error in eval(predvars, data, env) : object ‘Sepal.Length’ not found. Could you please help me out? Thanks in advance! How can I analyze Gujarati language texts for readability research by using R package e1071? Could you plz guide how can we get the predicted value (especially in regression) for each instance of the dataset. For instance, we have 5 variables, then how can we get the five predicted (numeric) values so that we compare these values with the actual values of the dataset. I am an enthusiast of R language. I am a asst prof and research scholar so i am working on ML and R. The post was very useful. I already worked with different packages but this is very simple than all other. I need one small advice, how can i make R as favorite language for my b.tech students. They are strongly supporting python but i want to make same interest with R also. Perhaps show things that R can do that Python cannot? Hi Jason, I’m at my wits end here. pulled all of my hair. have given up on google. searched high and low and cannot understand/get the answer to this question. i created a model ham/spam classifier…it’s fine. but now i want to use it on a BRAND NEW data. or run 1000 rows of brand new data through it. How the heck do i do this? i used the predict function, it works fine on the test data but on the new data (after i’ve done all the preprocessing) i get an error of object not found … object is a word and i’m assuming it doesn’t exist in one of the sets…i haven’t a clue. Perhaps post your code and error to stackoverflow or crossvalidated? Great post! Very useful. All the steps worked fine with some basic knowledge. Dependencies need to be installed. this was my first R experience and your tutorial helped me a lot. Although, the was seems to be long. For example: does “fit” support also other algorithms like e.g. tensor flow? When I go into the help system I cannot find anything about the possible algorithms. In this tutorial we did not use the algorithms directly, instead we used a helpful wrapper called: caret. You can learn about using the algorithms directly, but you must refer to and learn how to use each individual R package, which may be time consuming. nice tutorial. All worked fine for me except when trying to fit the linear algorithm “lda”. No matter which variables I’m using (I also tried with your example). The rest of models work perfectly. Perhaps the API has changed since the post was written, maybe skip that algorithm? I was wondering: after I get a good model that can make good prediction on new datasets, how can I say which parameters are more important for the prediction? In other words, which are the important features? For example In this case I can say that I.Setosa has short sepals and short petals (etc…). But can I get the same information printed from the script? Perhaps try an ablative experiment, where you refit the model with each feature removed in turn, and see which feature or features negatively impacts the performance of the model the most? Thanks Jason. I have a concern about dividing my dataset into 3: 70% for training, 15% for validation and 15% for testing. How do I divide this. Would I have to use the caret package? or do I have to make the validation as part of the training. I need a detailed description to this and the R code for it if possible. I couldn't find something concise relating to this online. Perhaps split into train/test first then split train into train/validation? It was a good tutorial for me. Ensure that caret is installed and loaded. It was installed and loaded. I referred other sources and I loaded other supporting packages to get it running. Hello jason, thank you for this demo on this algorithms. The explanation was quite clear and to the point. However, my question is, i use the above code to run a project but in the models i got some errors here is the descrription of my data..
“Error: data and reference should be factors with the same levels.” what does this error means? thank you and i need your response in both of my questions. Perhaps you need to convert the output variable in your data from numeric to a factor? try as.factor() for the variable. Thank you very much for the informative tutorial. I may miss some point here, each time I run the algorithm, I got different results. I mean that at one-time LDA was the most accurate model, another time kNN was and another time LDA, Cart, and rf had the same accuracy value. Surely, each time another train data set was used but the results were confusing. One thing, how can I see the coefficients of the models or can I? You can expect small differences over time given changes to the how the algorithms may have been implemented/updated. Thank you, your tutorial is very useful for my work. May I ask one question, how can add lebels of each line in the plot (blue pink and green line) as their species (“setosa” “versicolor” “virginica”) in “Density Plots of Iris Data By Class Value” ? Please suggest – how to fix the error ? Hi! Like others, I’m having trouble with the featureplot line. I tried updating R, and installing “ellipse” by itself and finally used the additional code for installing caret with the additional specifications. I am still getting “error in featurePlot (x=x, y=y, plot= “ellipse”) : could not find function “featurePlot”. Glad to hear you worked it out!